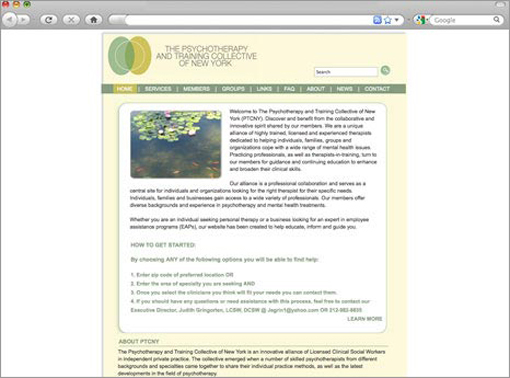 The Psychotherapists Training Collective of New York, a progressive group of professionals, has a diverse database of over 200 psychotherapists. They needed a site where potential patients could access that data. The site allows the collective’s members to post their bios, contact information, new and interesting research papers and to announce the formation of new groups. In addition, it has a highly functional search option, allowing users to search by an array of choices. Our choice of colors and photos was based on the assumption that if one were looking for a psychotherapist, one was troubled and, accordingly, would need to be comforted.